Jay Morey is a freelance writer living in London who also happens to be a Sammo Hung fanatic ,so when she is not watching our Sammo.She has her own columns which she writes about Music and Sport.As well as film reviews.This is the second review from Jay for the site . Here at K.I.T.G. 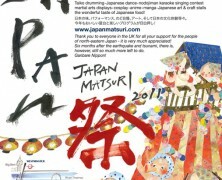 we thank Jay Morey for the use of her review and hope she will contribute many more. To be credited with the creation of an entire sub-genre in the world of cinema is a desirable and enviable addition to any CV. 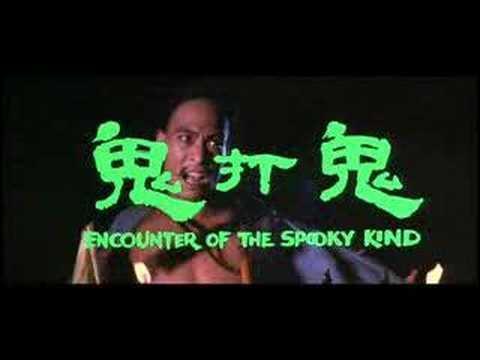 Already an established and innovative actor, director and stunt choreographer, Sammo Hung decided to expand on his repertoire with this classic of Hong Kong film, delivering supernatural / horror kung-fu to the world. Sam Raimi’s Evil Dead even dropped a nod to this masterpiece. Snapping awake and realizing it was an awful dream; Bold faces the reality of another day of a low-paid job and arguments with a pernickety spouse. She sees him as quite worthless and taunts him with her new silk clothes, perhaps bought by a much wealthier lover? Bold lives in near poverty in1800s China working as a driver for respected wealthy magistrate Mr. Tam, who like to frequent the local brothels. Bold distracts himself from his marriage troubles by making bets with his fellow eccentric drivers during his breaks. As his name suggests he’s a braggart and won’t back away from a challenge, even if it’s based in the occult. A scene mildly familiar to fans of future horror classic ‘Candyman’ sees Cheung visit a ramshackle and supposedly haunted house to play Peel-Apple. 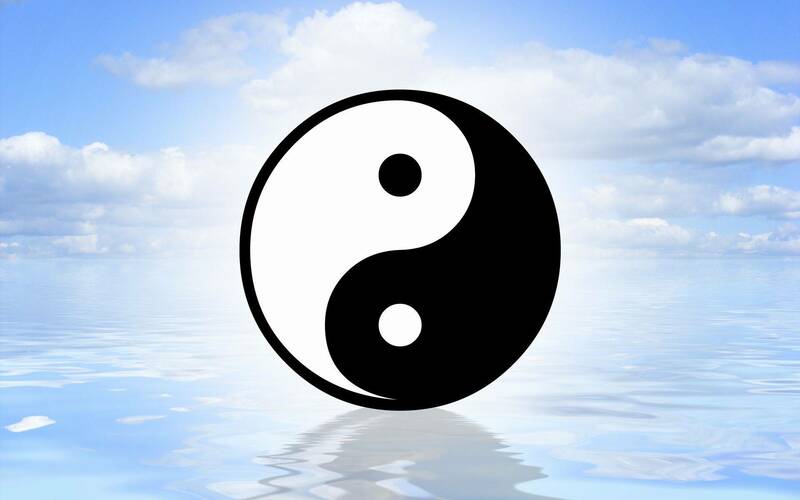 He’s to skin the fruit without breaking the rind in front of a mirror. A good-humoured prank soon turns sinister as a real ghostly lady, half deformed, reaches through the glass and across the room for his soul. Bold manages to escape, this time, but unlucky events seem to be stacking against him. Using a lunch break to try and catch his wife cheating, Bold spies through a crack in his front door to see her being caressed. After battling to break down the door, he finds her dressed and denying all knowledge. Again she goads him for his stupidity and sees he is carrying a cleaver. Whilst taunting him to kill her in front of their nosy neighbours the cuckold finds a shoe that doesn’t fit him – does he finally have the evidence he needs? An offer to stay locked in a Temple overnight with corpses is made by a stranger who knows of his reputation. Unable to resist the prize of some ten taels of silver if he succeeds, Bold sets off. A good wizard named Tsui (Fatt) makes his acquaintance in the woods to offer advice of how to stay alive – it’s a night with animated corpses. The corpses are an extension of an evil wizard, Hoi, who’s been paid to kill Bold. Surviving the night dazed, he is let out of the Temple by the stranger. In a near catatonic state he agrees to another night and it starts to become clear to him he is not just gambling for money, he’s gambling with his life. Enlisting the help of the friendly Tsui, Bold makes repair for another night with chicken eggs and a wooden bowl of black dog legs and blood. The first fight scene sees Bold trying to keep the staccato corpses at bay with these ingredients and some high-energy martial arts. After his trails in the dusty Temple, Cheung comes home to find no wife but blood. Wrongly accused of his wife’s apparent murder, Bold is arrested by police chief (Lam Ching-Ying). He escapes prison to go on the run with not only the police Chief after him but also Hoi, both determined he should die. Inspired dextrous fight sequences allow Hung to enlist his superior physical prowess and control. A tea-house fight scene features expert swordplay, whilst spiritual body possession sees a mish-mash of styles, such as monkey, facing off with spear-work and acrobatics. Hung’s unrivaled comedy vision adds its customary dash of fun with an anachronistic game of YMCA with a freshly animated maggot-ridden corpse. ‘Encounters’ effects are a victim of the era, but they charm the viewer rather than elicit derision. An example being the spectre of lady who reaches for our hero through the mirror - the elongated arms stretching for Bold evoke more of a smile than any terror. The blood of his ‘murder victim’ is an off colour runny paint, and the demonic manifestations seem too human and alive, yet this helps the movies abundant charm filter through. These minor niggles contrast with wonderful mood lighting, period 1800s settings and dress, and incidental music reminiscent of ‘The Shining’. 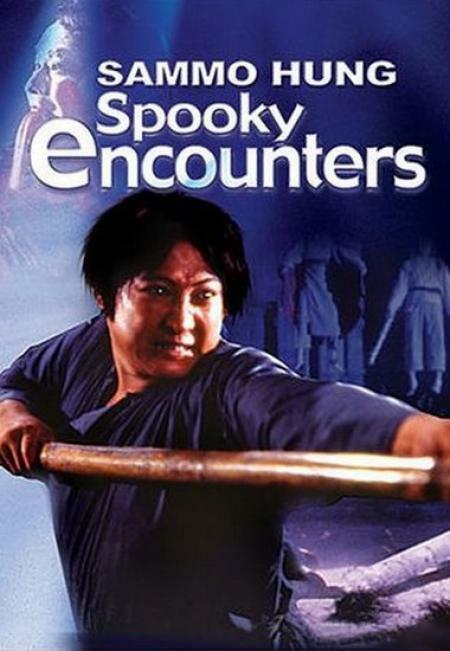 ‘Encounters Of The Spooky Kind’ gives us an entertaining and ground-breaking example of a genre the East is now renowned for. This is a revised Review Jay sent to me ,as a certain other publisher required her to rewrite it.Instead of replacing it i thought i would have both on the same page. Bold (Hung) lives in1800s China in near poverty with a pernickety cheating wife and a low-paid job ferrying Mr. Tam, a wealthy resident, to and from the local brothels. As his name suggests he’s a braggart and won’t back away from a challenge, even if it’s based in the occult. 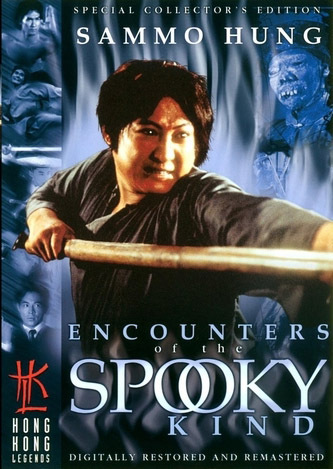 The film follows Bold’s battles against an evil wizard, employed by his wife’s lover, trying to survive stays in haunted Temples and battles against manifestations of evil spirits. 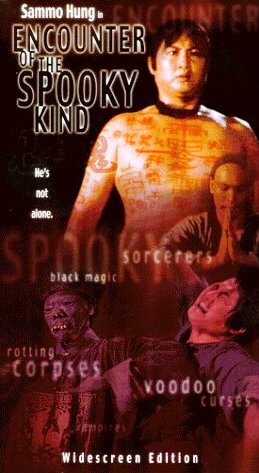 Aided by friendly wizard Tsui (Fatt), can he defeat those who’re out to kill him, or will the underworld have their wicked way? ‘Encounters’ effects are a victim of the era, but they charm the viewer rather than elicit derision. An example being the spectre of lady who reaches for our hero through the mirror – in a scene mildly familiar to fans of future horror classic ‘Candyman’- elongated arms stretching for Bold evoke more of a smile than any terror. The blood is an off colour runny paint, and the demonic manifestations seem too human and alive, yet this helps the movies abundant charm filter through. These minor niggles contrast with wonderful mood lighting, period 1800s settings and dress, and incidental music reminiscent of ‘The Shining’. Inspired dextrose fight sequences allow Hung to enlist his superior physical prowess and control. 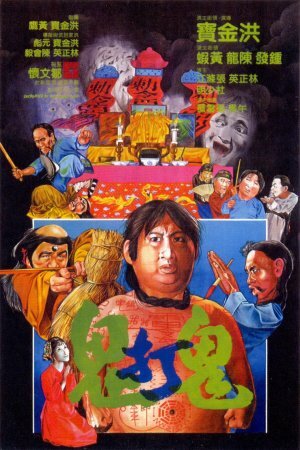 A tea-house scene features his arm being possessed by the evil wizard using voodoo, leading to an inspired fight scene where one arm is working for him and another against. The tea-house segment also features expert swordplay, whilst spiritual body possession sees a mish-mash of styles, such as monkey, facing off with spear-work and acrobatics. Hung’s unrivaled comedy vision is also apparent, adding its customary dash of fun with an anachronistic game of YMCA with a freshly animated maggot-ridden corpse.